Physical and Mental Challenges « What's a Girl to Do? I’m not sure how old I was in this photo–but it can’t be a lot more than five! Tears flooded my pillow on the eve of my fifth birthday. Lying in my bed on Lawn Ridge Road in Orange, New Jersey, I couldn’t stop thinking about the milestone to come. First I would be five, I reasoned. And then I would be twenty. And then I would be old. My life was almost over. 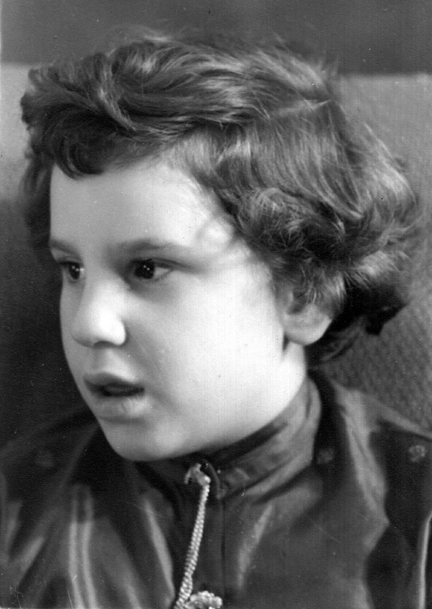 In vain my mother reassured me that five year olds all over the world appeared happy with their lot—and that I had quite a few years to go before my life ended. I refused to believe her. It was hours before I fell asleep, exhausted with worry. I repeated the pattern when I turned ten. My mother, who had spent many years as an elementary school teacher, tried to convince me that ten was one of the best ages a person could turn. In retrospect, I realize that she was right. Ten is a golden year, when children are secure and knowledgeable and coordinated, and their hormones haven’t kicked in to confuse things. At nine years and 364 days, however, I was convinced that the next day I would have one foot in the grave. Maybe even a foot and a half. Over the years, I learned to handle my fear of aging. Having noticed that the numbers divisible by five seemed the most daunting, I decided at the age of 20 never to reach one of those numbers again. When the calendar wanted me to turn 25, I turned 24 for the second time. The next year I went straight to 26. I stayed there for a while; 26 seemed like a good age. Eventually, I stopped changing ages altogether. I still celebrated my birthday—who doesn’t love a birthday party?—but I eventually established a practice of turning 39 year after year after year. If it was good enough for Jack Benny, it was good enough for me. I could probably find a therapist to explain and treat my fear of aging. I’m no dummy, however, and I’m pretty sure I understand the cause of this phobia. I was very smart at a very early age. As a consequence, for the first 20 years or so of my life I was generally the youngest person in my social set to enter a grade in school or play a role in a play or read a “grownup” book or learn a mathematical skill. I defined myself by my youth. Any threat to that youth—and the calendar is the ultimate threat to youth—seemed to threaten my essence. I spent most of my life worrying about aging. When at the age of 27 I saw the first gray hairs glinting on my head in the rearview mirror of my car I almost ran the car off the road in panic. I called my mother to tell her about this incident. At the time she was in her 60s and still had NO gray hair. (I inherited my father’s hair; he looked like a brillo pad for much of his life.) “Is the car all right?” she asked. I was indignant. “Your daughter’s hair is turning gray, and all you care about is a mechanical device?” I huffed into the phone. I soon found that l’Oreal could help me with the gray hair—but not with the aging. 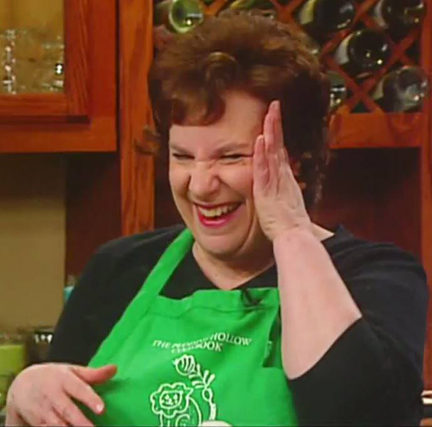 A couple of years ago, my fear of aging began to abate. A recent photo. DEFINITELY old(er)–but happy. I had just finished Pulling Taffy, my memoir about caring for my mother in her last years when she suffered from Alzheimer’s disease. I spoke at women’s clubs, church groups, and senior centers about the strategies I had developed over time for caring for her and the lessons we had learned together. One evening during the question-and-answer session that followed one of my talks a woman thanked me for the knowledge I was sharing, noting that she would put it to good use. It suddenly hit me that the most valuable part of my talks—and indeed the most valuable part of me—was the experience and knowledge I had developed over the years. I would no longer be the youngest in most of the circles I would frequent. But I could try to be one of the wisest, I realized. Now I believe that I haven’t wasted time. I have invested it. My wrinkles aren’t signs of decay. They are signs of life. I have to admit that I’m still officially 39. And I’m not allowing my hair to go gray. One has one’s standards to uphold. I no longer get upset if someone accidentally looks at my driver’s license and discovers my birth year, however. I have too many things to do, too many new things to learn, and too many lessons to share. When I REALLY become old (in 30 years or so), I’ll be awesome. Meanwhile, I have come to appreciate age everywhere, particularly in fiction, where older characters often have some much more … well … character than youthful heroes and heroines. 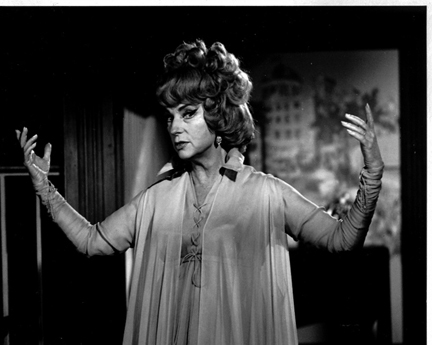 Don’t most people, secretly, prefer Endora to Samantha in Bewitched? I certainly do. She’s much more colorful, much more dramatic, much more fun. And she’s not afraid of her own powers…. 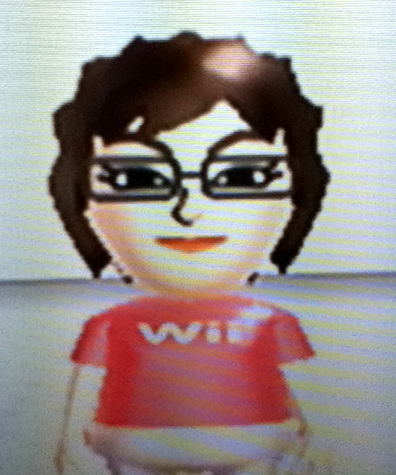 My onscreen Wii persona. We both wear glasses to help with our depth perception … although OF COURSE I take mine off when the machine weighs me! How do you get better at something for which you have very little aptitude? I have always been a klutz at sports. One of my legs was slightly misshapen when I was very small (I have very early recollections of wearing a brace), and although it was more or less fixed the two legs don’t always work together very well. I made my legs and balance worse a few years back by slipping on the ice TWICE in the same winter and banging my right knee both times. In addition to the leg issue, I have poor depth perception (my glasses help a little but don’t solve the problem) and pathetic hand-eye coordination. The only game I played with any skill in my youth was tennis. The racket was big enough to give me a good chance of hitting the ball even if I couldn’t see exactly where the darn thing was. I wasn’t a great tennis player, but I had fun. Ironically, I mastered the form well enough so that in high school I taught tennis to the other girls in my physical-education class. My pupils could beat me at the game almost immediately, but teaching them gratified me nonetheless. In general in my adult life my sports of choice—if one doesn’t count bridge as a sport, which I really think one should!—have been walking with the dog and swimming. I don’t do either very quickly, but they keep me moving and breathing. Let’s call them physical activities rather than sports. And my usual swimming hole, the Dam down the road at Singing Brook Farm, was hit hard by Hurricane Irene at the end of last summer. We hope it will be fixed in time for next year, but the process of getting the proper permits to do anything in a waterway is cumbersome and lengthy. So swimming more than a couple of strokes is out. With fewer walks and fewer swims I have hauled out the Wii fitness program I purchased a couple of years ago. The Wii can drive me nuts. It loves to weigh me (never my favorite activity) and to administer little tests that allegedly determine my “Wii Fit Age.” Depending on the tests the machine chooses, that age can vary by as much as 30 years. I have learned to ignore it. Many of the tasks the Wii prescribes to correct my balance and hone my coordination remind me of the difficulties of my youth. I gave up skiing after a few tries because it was almost impossible for me to move smoothly on the snow. And skating … well, the last time I went roller skating I spent more time on the floor of the rink than on my feet. My roommate informed me that the black-and-blue marks made me look as though I had a REALLY abusive boyfriend. Despite its critical tone the Wii is easier to handle than some of the classes I took in my youth, in which I had to watch everyone else get better while I stayed the same. (I took beginning ballet for years, with no hope of graduating to toe work.) I can work at my own pace with no competition but myself. And I can try again … and again … and again until I more or less get the hang of the tasks at hand. I’ll never be a candidate for the Olympics. I am learning to learn, however. And that’s an activity I can enjoy.